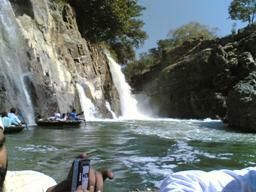 Hogenekkal waterfalls are known as "Niagra of India," situated in Hoganekkal village of Tamil Nadu. This enchanting picnic spot is attracting visitors from all over the world. The locals believe that the water here has curative powers. This beautiful village is near the Kaveri (Cauveri) river and is one of the most beautiful destinations of Tamil Nadu. There are so many waterfalls all over the place that it looks like the Mother earth decided to open her heart to the humanity, spread into two sections. The major part of the waterfalls are on the first section and the second section is a gorge which forms the downstream of all the waterfalls. The main attractions of this spot are the coracles, masseurs and roaring waters. The visitors can enjoy a ride in the coracles through the shimmering, rippling river, and reach near the mighty waterfalls. It is a thrilling experience. 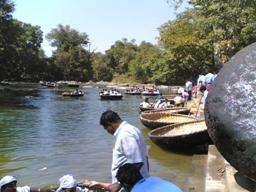 The coracles are circular basket boats are covered with black plastic sheets. Another great thing to do here is to enjoy the diving skills of the village kids for a small fee. They dive from a height of around 30 feet into the water and climb straight up back on the rocks in no time. Those who are crazy for a massage, can experience a massage therapy here. Both male and female masseurs are available here. 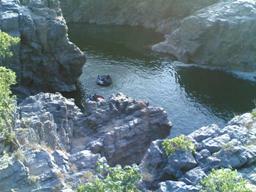 Hogenakkal is unique as it is the only natural, traditional river spa in the land.